In this article I’ll show you how I connected a SainSmart 1.8″ Color display to my Arduino Uno and I’ll show you how to get some basic things to work. The Arduino does not come with a display, and that’s perfectly fine as it’s intended to be used as a micro-controller and not a micro-computer. Adding a display however, may be needed at times though to provide user feedback for when a user is using your marvelous Arduino invention. User feedback can be done in several ways of course: a simple beep, a simple LED, a simple LCD screen, or like in this case, a more advanced Color Display. Considering the price I decided to get one ($20 at Amazon, $13 at SainSmart, starting at $13 on eBay, or an Arduino version at AdaFruit for $20) and experiment with it. This 1.8″ display, can display 128 x 160 pixels, is capable of displaying 262,144 (18-bit) colors, measures 5 cm x 3.5 cm, and is about 6 mm thick. The display has back-light and comes with a Micro-SD-Card reader (supporting FAT16 or FAT32 formatted Micro-SD-Cards). The display is driven by a ST7735R controller (specifications), can be used in a “slow” and a “fast” write mode, and is 3.3V/5V compatible. It’s size, and display qualities, makes this a very desirable display for use with the Arduino, or even Raspberry Pi (as shown on this website). This article is written with the SainSmart/Amazon version in mind – the pin-out of the AdaFruit board is slightly different! I illustrate the differences in the tables, so please pay attention. Note : The Shield version by AdaFruit also has a 5 direction “joystick” on board. To save you a lot of time developing applications (Sketches) that use the display, both SainSmart and AdaFruit offer very helpful libraries. Since the libraries offered by SainSmart can be confusing for beginners, we will use to the Libraries offered by AdaFruit. The AdaFruit libraries are clearly designed for use with the Arduino developer tools, whereas the SainSmart files are less obvious for that purpose. This is exactly the reason why I think buying your hardware at AdaFruit is recommended, for the one or two extra dollars, you’ll get awesome support. Adafruit_GFX for graphics library functions like drawing lines, circles, etc. which is independent of the used controller. Adafruit_ST7735 is the library we need to pair with the graphics library for hardware specific functions of the ST7735 TFT Display/SD-Card controller. For SD-Card support you’ll also need the SD library from Adafruit. As usual two options to get the files. Get the files from GitHub (Adafruit_GFX, Adafruit_ST7735 and optionally SD) or download the files from Tweaking4All. The Tweaking4All files can be outdated, so always check for updates at the GitHub pages. After download, install them in your Arduino software via the menu “Sketch” “Import Library…” “Add Library…”. In the file dialog select the downloaded ZIP file and your library will be installed automatically. This will automatically install the library for you (requires Arduino 1.0.5 or newer). Restarting your Arduino software is recommended as it will make the examples visible in the examples menu. With the current Adafruit software, the downloaded ZIP files from GitHub can be problematic when installing. The easiest way to remedy this is by extracting the GitHub ZIP file. Place the files in a directory with the proper library name (Adafruit_GFX, Adafruit_ST7735 or SD) and zip the folder (Adafruit_GFX, Adafruit_ST7735.zip, SD.zip). 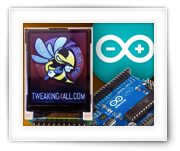 Now the Arduino software can read and install the library automatically for you. In this example we will use an Arduino Uno R3, but I’m confident it will work with other Arduino versions as well. The pin-out is for the SainSmart version of this display! If you’re like me, then you might be able to guess the purpose of the pins, but you might not be quite sure yet what to do with them. Basically, besides the obvious backlight, we tell the controller first what we are talking to with the CS pins. CS(TFT) selects data to be for the Display, and CS(SD) to set data for the SD-Card. Data is written to the selected device through SDA (display) or MOSI (SD-Card). Data is read from the SD-Card through MISO. MOSI = Master Out Slave In, or in other words: The Master (Arduino) sends data out to the Slave (Display). 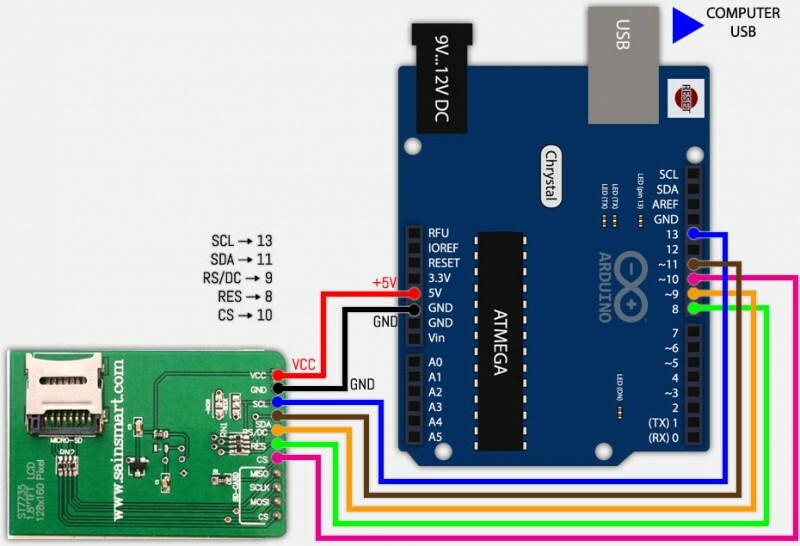 MISO = Master In Slave Out, or the Slave (Display) sends data out to the Master (Arduino). Both, for exchanging data and commands, of course need a clock for proper timing: SCL for the Display, and SCLK for the SD-Card. For the display we need additionally the ability to toggle between sending data (text, drawings, etc) and sending command (clear screen, etc). And we need a reset option for the display as well of course. So when using both display and SD-Card, and utilizing the Adafruit libraries with a SainSmart display, you will need to connect SDA to MOSI, and SCL to SCLK. Note that this does make sense, since the controller often works either in Display or SD-Card mode (through the chip select pins). Well, I guess those are pretty obvious – connect them and your display has a backlight. Vcc goes to +5 Volt (it’s actually 3.3 to 5V) and GND goes to ground. Note : In either case, backlight is desired of course. Note : The selected pins depend on the definitions in your Arduino sketch and on the type of pins needed (PWM vs SPI). Note : Adafruit displays can have different colored tabs on the transparent label on your display. You might need to adapt your code if your display shows a little odd shift. I noticed that my SainSmart display (gree tab) behaves best with the code for the black tab – try them out to see which one works best for yours. Low Speed display is about 1/5 of the speed of High Speed display, which makes it only suitable for particular purposes, but at least the SPI pins of the Arduino are available. For this purpose the PWM pins are being used as displayed in the table below. After connecting the display in Low Speed configuration, you can load the first example from the Arduino Software (“File” “Example” “Adafruit_ST7735” – recommend starting with the “graphictest“). Make sure to comment and un-comment the right parts and double check that the pin numbers in the defines match the pins you’re using. //Use these pins for the shield! Compile and Upload the Sketch and you should see the first results on your new TFT screen. High Speed is almost 5 times faster (according to Adafruit 4 – 8x faster) than Low Speed display and you’ll really notice the difference. For High Speed display we will need to use the SPI pins of the Arduino – which can be a problem when you’d like to use these pics for other purposes. As with the previous setup; we will need to make sure that the proper lines are marked as comments or code. Compile and upload, and you will notice that this demo goes a lot faster now. For working with the SD-Card we will need to do some additional wiring and the display wiring will be based on the Fast Display Mode. as mentioned before: The used pins depends on the defined pins in the Sketch, but here we assume the presented pins. Note that SCLK is connected to SCL, and that MOSI is connected to SDA for the SainSmart variant of the 1.8″ TFT LCD Color Display. Before we can test this, we will need a 120×160 pixel BMP picture (24-bit) on an SD-Card. The SD-Card needs to be FAT-16 or FAT-32 formatted, single partition, and the BMP file needs to be placed in the root (ie. not in a directory or anything like that). You can name your BMP file “parrot.bmp” or modify the Sketch to have the proper filename (in “spitftbitmap” line 70, and in “soft_spitftbitmap” line 74). Example: bmpDraw("mypicture.bmp", 0, 0); (in case you call your file “mypicture.bmp”). // TFT display and SD card will share the hardware SPI interface. // Duemilanove, etc., pin 11 = MOSI, pin 12 = MISO, pin 13 = SCK. Now that we did our first tests, time to play around with some of the basic functions to display data on a display. As you have seen before the Adafruit_GFX library (supported by the Adafruit_ST7735 library) makes this easy for us – More information can be found at the GFX Reference page. Based on our High Speed Display example: The following basic steps are needed before we can work with the graphics display. The first block is to define the pins (lines 4-8), next add the needed libraries with includes (lines 12-14). After that we need to define the variable “tft” of the object type “Adafruit_ST7735” (line 18). In the setup() function one would typically first blank the screen (line 22). Your code then can either be placed in setup() for a one time run or in loop() for repeating the code over and over again. The display is build up out of pixels, which each can be addressed through a X,Y coordinate system. Back in school the X went from left to right, and Y from bottom to top. This is not the case in this X,Y system. X still goes from left to right, but Y goes from top to bottom as shown below – which is very common in displayes. Remember : Origin (0,0) is the UPPER LEFT CORNER. 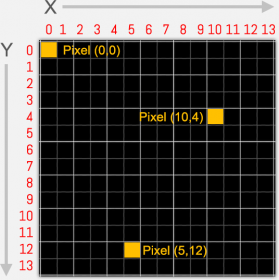 Pixels in monochrome displays are easy: the pixels is either ON (1) or OFF (0). With color displays this whole thing works a little bit more complicated as a color is build up out of 3 base colors: Red, Green and Blue. Depending on your display this can be for example in 8 bit (256 colors), 16 bit (65,536 colors), 24 bit (16,777,216 colors), etc. Our display (SainSmart or Adafruit) uses 16 bit colors. Calculating colors, for this screen can be done with the Color565 function of the ST7735 Library, which takes 3 parameters: Red, Green and Blue. For Red and Blue only 5 bits are used, and for Green it’s 6 bits (don’t ask me why), but you don’t have to worry about that with this function. This function calculates the 16-bit color code, based on the 3 values red, green and blue (all 3 are 8 bit numbers). You can pass variables (int), or enter numbers straight. I found the easiest way to pick a color is by looking at HTML Color codes, and for this purpose I’ve added one on this page. Click the input box and a popup will show a color picker. Choose your color, and the hex value will appear. To use this in your Arduino Sketch: The first 2 characters represent RED, the second set of two characters is for GREEN and the last 2 characters represent BLUE. Add ‘0x’ in front of each of these hex values when using them (‘0x’ designates a hexadecimal value). The hex values are: red is B7, green is 00 and blue is FE. Note : You can of course, use any application for color picking that shows hex values, or for example the color picker in Adobe Photoshop. Draws a single pixel at (x,y) in the indicated color. Draw a line from (x0,y0) to (x1,y1) in the indicated color. Draws a horizontal line, starting at (x,y), of indicated width and color. This function works faster for horizontal lines when compare to drawLine(). Draws a vertical line, starting at (x,y), of indicated height and color. This function works faster for vertical lines when compare to drawLine(). Draws an open rectangle, starting at (x,y) with a width, height, and a border line in the indicated color. (x,y) indicates the upper left corner. Draws a filled rectangle, starting at (x,y) with a width, height, in the indicated color. Draws an open circle at (x,y) with the indicated radius (in pixels) and a border in indicated color. (x,y) indicates the center of the circle. Draws a filled circle at (x,y) with indicated radius and filled with indicated color. Draws an open triangle, between the points (x0,y0), (x1,y1) and (x2,y2), with a border in the indicated color. Draws a filled triangle, between the points (x0,y0), (x1,y1) and (x2,y2), in the indicated color. Draws an open rectangle with rounded corners at (x,y) with indicated width and height and a border in the indicated color. The radius indicates the radius of the individual corners. (x,y) indicates the upper left corner of the rounded rectangle. If radius times 2 is greater than the width or height: be prepared to see some unexpected effects. Draws a filled rectangle with rounded corners at (x,y) with indicated width and height in the indicated color. This function can draw a single color bitmap (not to be confused with a BMP file). For this you’ll need to define the constant “bitmap”. The use of this function is a little beyond the scope of this article, but I just wanted to show that there is more depth to these libraries. The bitmap upper left corner is (x,y), presumed to have a width and height as indicated, and will be drawn in the indicated color. Draws a character at a given location (x,y), where (x,y) represents the upper left corner of the character. Positions the text “cursor” at the given location. This is where the text output continues when using print() or println(). Prints the given text string at the current cursor position. The println() variant will add a carriage return, so that the next text output starts on a new line. This sets the font color. Everything printed AFTER this statement will appear in the indicated color. This sets the font background color. Everything printed AFTER this statement will appear with the indicated background color. With this statement, you can set the font size for tekst out put AFTER this statement. Typically fontsize values are 1,2,3,4,5,6,7,8,9,10, etc. See the demo below for an example output. The size is an arbitrary number and does not match for example pixel height or anything like that. Enable (true) or disable (false) word wrapping at the end of a line and will only affect text output AFTER this statement. This function is used to indicate what corner of your display is considered (0,0), which in essence rotates the coordinate system 0, 90, 180 or 270 degrees. The SainSmart display uses (0,0) as the upper left corner when the display is standing up right (i.e. pins in a breadboard for example). However, if your application needs your screen sideways, then you’d want to rotate the screen 90 degrees, effectively changing the display from a 128×160 pixel (WxH) screen to a 160×128 pixel display. Valid values are: 0 (0 degrees), 1 (90 degrees), 2 (180 degrees) and 3 (270 degrees). Fills the entire screen with a give color, ideal for example for blanking the screen by setting the color to black. Based on these functions, I did create a little demo to show what these functions do. Either download the file or just copy the code and paste it into an empty Arduino Sketch. // for 1.8" TFT LCD Color Display (SainSmart). In the demo and the text, not all functions have been explained or demoed. Functions like the use of bitmaps and custom fonts is something I haven’t done much with (yet), but might certainly be worth exploring. There are 128 comments. You can read them below. Thanks so much for your tutorial! I just don’t understand the SD Card wiring. How can I connect SCLK to SCL and MOSI to SDA on my Sainsmart TFT LCD? I was using male-female wires in all my wiring but I just don’t know how to wire those two things. I would love to help out, but I’m not sure what the problem is that you’re running into. If I understand you correctly, you’re not having the right wires? I used a breadboard for the experiment, which gives me the option to connect multiple wires to one pin. Another trick, if you’re not using a breadboard and your wire ends allow this, is by sticking a wire in the back of the wire that’s already there – it’s not perfect and like I said, it depends on the ends of your jumper wires, mine allow this (although it most certainly was not made for that). For a final setup, you could split a wire and solder it together with another wire. I apologize if I didn’t understand you question correctly. Thanks for the reply, Hans! I apologize for not being specific in my issue. I’m a beginner in these things but I’ll try detailing it as well as possible. In your tutorial, I connected each part of my LCD to the Arduino exactly as you said. However, I wasn’t using a breadboard so I wasn’t able to connect multiple wires to one pin as you did. This is why I didn’t (and still don’t) know what to do when you mention that SCLK should be connected to SCL (which is then connected to pin 13) and MOSI to SDA (which is then connected to pin 11) on my LCD. I understood that SCL is connected to pin 13 and that SDA is connected to pin 11 but how can I connect SCLK to SCL and MOSI to SDA? Basically, How can I connect a pin on my LCD to another pin on the same LCD without using a breadboard? PS: If I am to use a breadboard just to connect SCLK to pin 13 and MOSI to pin 11, is it still possible to have my LCD not fixed to the breadboard? If it is possible, then how do I do so? I apologize if I still don’t make any sense! So you’re wondering how to connect 2 connectors to one pin (basically), right? I guess it depends on the materials you have available,… breadboard (for experimenting) works easiest, but for a “final” product it’s obviously not a good solution. For a final product I’d actually make a suitable cable for that, with 3 ends. One end to the Arduino, and the other 2 ends to each of the LCD pins. If you’re just using jumper wires, then you could cut two of them in 2 pieces. I’d say, one cut in the middle, strip the wires at the ends you cut and twist them together. Grab the 2nd jumper wire and cut it as close as possible to the pin you don’t need or want to use. Strip the wire again and twist it with the previous cable you made. This way you might be able to still use it in other future projects. You could also consider using a Multiway Screw terminal (a.k.a. “kroonsteen” in Dutch) and bind the pins together there (link for a picture), or you could consider using test cable with crocodile clip (picture). Do you know if you can use the Arduino TFT library with the SainSmart 1.8 TFT ? After reading the Arduino website, it sounds likes the Arduino library adds things to the GFX and ST3775 library that may not work with the SainSmart TFT…..
Just tested with arduino TFT library. It works! But you must adjust screen orientation using setRotation(0) to match arduino TFT screen. Thanks Neil for letting us know – this is good news and I’m sure others will benefit from this. Would you say the Arduino library is better (smaller/faster)? Either way; it’s nice to know that it’s compatible … for when one would like to use an existing sketch that already uses the Arduino lib! sounds to me that there is something wrong with the way the library has been installed. I’d at least check that out. Thank you for this tutorial. But I could use some help. I want to have the LCD sideways and in the center of the screen have text scrolling across the screen. I need the text to be set in one line not spaced out like this. Also if possible it would be cool to have variable text size and scrolling speed. If this is not possible or part of it is not let me know. Sounds like you need to use the “setRotation” function first, so text is displayed sideways. With functions like “setCursor(x, y);” you can position the text, and “print(“Something”);” and allow you to print the text at indicated position. “setTextSize” allows you to change font size, but you could also explore the option to upload your oen font/font size. I hope this helps you get started – unfortunately, I’m not anywhere near my equipment (traveling) to do some of these tests for you. I am having issues with getting the high speed code to work. The low speed works just fine but as soon as I modify the pins listing and comment/uncomment the two lines of code the display just stays white. If you modified the code and changed the physical pins, then the high speed code should work just fine. I’m assuming you’re using the exactly same display? I am using the following components for my project :SainSmart MEGA2560 R3, SainSmart 7″ TFT LCD Display, SainSmart TFT LCD Adjustable Shield. I wanted to get the .bmp file image on the lcd screen to create some user interface. So which libraries should i use in order to suceed in my task. PS: I tried Arduino TFT library, but I think it is not compatible to this display kind. Did you mean this one (found at Amazon)? They state that they “will provided you the whole document including the example project of the kit“. At Amazon they provide a link to a downloadable zip file for this setup. The ZIP file has a folder in it called “CTE_MEGA_shield” which seems to address how to connect it to the Arduino. In the end, I’m not quite sure what setup you’re using, do you have a link? At the SainSmart website they also offer an email address for support: support@sainsmart.com. Maybe you can contact them? Sainsmart is worst in technical support, won’t reply any of our mails, regretting buying their product. Currently I have UTFT and UTFT_touch libraries, but there’s no example in it to try how to get the image from SD card on to the screen. So please assist. I know they are not the “cleanest” when it comes to support. I’ve also read some comments at Amazon – for some it works great for other not at all. I just downloaded the file they offer at Amazon (your link), it does include the library (UTouch_DUE) and a demo, I assume those work? Under the firectory “UTFT_DUE” I do see some files suggesting the ability to display a PICture. Maybe the UTFT info here can get you started, and I assume this UTouch info will be helpful as well? Examples like button test, calibration , Quickdraw, etc., with respect to those libraries are working fine. But there is no example on image fetch from SD. So I am not sure which libraries I should go with. UTFT         myGLCD(ITDB32S, 38, 39, 40, 41);   // Remember to change the model parameter to suit your display module! that sounds like we might have a typo or wrong path for the picture file? From your filename I assume it’s placed in root, and saved as you described (allcaps)? I also noticed that you will need to convert a picture first, but by the filename you’re using, you have indeed done this. In the documentation, it also states: “Requires that you #include <avr/pgmspace.h> when using an Arduino other than the Due” (Page 8 of the reference manual). Obviously just for testing, and if you use only one picture then you might want to remove the loop, or even move this to the “setup()” section (since it might be needed only once). Not sure if the latter will matter or not. thank you very very much for your efforts to provide this perfect tutorial! For a (still secret ;-) project I build up your configuration and it works perfectly! I want to file my project also in an tutorial and therefore I ask you kindly, if you could provide me your fritzing library for the Display? many thanks in advance an go ahead with further perfect tutorials! A secret project,… interesting …. As for the libraries: In the green boxes above you’ll find the files, but I’m not the copyright holder of those files. You’d have to contact the creators through their website (AdaFruit). Since they are on Github, I assume you’re free to use them, just keep the Copyright statements in tact. thank you very much for your quick response. 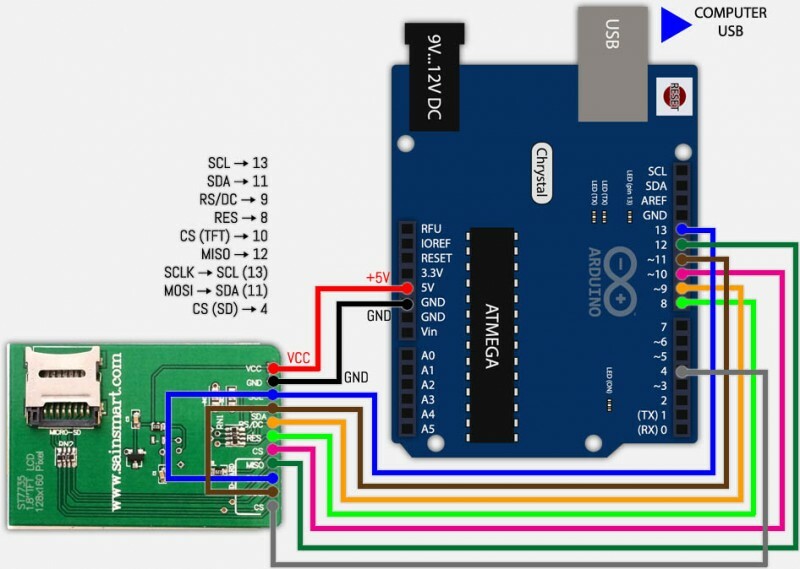 Sorry, my request was not clear enough described (I didn’t mean the arduino/adfruit libraries for the Arduino IDE): I want to file my project with nice self explaining pictures like your tutorial here. Therefor I asume you used also fritzing to make pictures like fig4. right? These files are a type *.fzz if I know this right. Up to now I couldn’t find a fritzing library for the Display. Hopefully I’m not to stupid but up to now I could find this in the standard fritzing library. damned – I pushed the wrong button (not reply..) please move my last input to the tread above – if possible. thx! Dorry for not right away understand what you’re asking, … I was not familiar with Fritzing (thanks for the tip though!). I actually did draw these figures with PhotoShop … Based on a drawing I once made of the Arduino Uno I (and re-using it in each drawing). Looking at the Fritzing website, it seems that there should be an Arduino component though, but the display might be a problem, but I have yet to test it. I also have seen quite a few folks working with so called Arduino Simulators/Emulators, AutoDesk (it’s free as far as I can see) allows you to make electronic designs as well with 123D Circuits and allows you to download the image as well. Not sure if they have the display available though either …. ah fine – this explains a lot. Thanks for information to the other simulators, I will have a look at them. If I will succseed with fritzing I will let you know. Again, many thanks for your efforts! I created a *.svg-file with “Sketsa SVG Editor” and created a new part in fritzing – it works ! This took my just 20 Minutes, so I think, the work is useful. If there out is none with better proposal I will share this tutorial in short time on an appropriate forum. Please feel free to share it in the Arduino forum here … I’m sure others will benefit from it in the future. Thank you very much for the hard work and for sharing! Thanks Dirk, and you’re most welcome! When i tried to show the data on the screen though, by adding some code from and example i found using the same tft, i noticed that the data logging shield can’t write on the SD card anymore. First thing that comes to mind is a conflict in used libraries maybe? Even if you’re not using the SD card functionality, maybe something in one of the libraries is still “talking” to the pins and therefor conflicting with another library? I’m just guessing here, since I do not know all the details of your setup. But most often I found that to be the cause of such unexpected issues. I do not have the AdaFruit Data Logger Shield, and at first glance I see RT Clock and space to solder as an advantage, but not much more than that (please correct me if there are mote advantages). Can you run your experiments without the data logger? Just to see if everything works fine anyway. After all, the TFT has an SD card available. This piece of code always worked before, without using the tft, so i’m guessing it’s this piece of code that made the conflict happen. Interesting … what is “logfile”? An object, function or a variable? If it’s an object or function, might it initializing something that interferes? As far as i’m concerned, i think it’s the file created to write on (a .csv file), a bit like writing on a tft or lcd. As I understand, such a file is created each time you start the Arduino – so boot the Arduino 99 times and you’re done … not sure why that second part would break things though. thanks for that nice tutorial! Two questions: I cannot manage to get the display into sleep mode with the DISP_OFF flag. How do I do it? Also, is it possible to deactivate the backlight by software command? Thanks you very much for the compliment! Unfortunately, I’m traveling at the moment and am nowhere near my stuff to try what might work and what not. I’m pretty sure though there is a way to get the backlight to go off – or maybe better put: get the display to go to sleep. In that way I can use “writecommand(SLPIN);” and “writecommand(DISP_OFF);”. However, by using that, the display goes white and the LED backlight remains switched on. No content is shown anymore. But having the display in a bright white even with backlight is not the sleep mode or display off mode that I would expect . It seems that the LED backlight is powered by a regulator or another circuit on board, since there is no backlight pin as in the Adafruit version of the screen. I will try to get more familiar with the libraries and that stuff. Thanks, and have a nice journey. I wish I could access my stuff right now to test along,… please let us know if you find out a trick that might do it right. I’d be very interested in that as well – specially when I decide to use the display in a more permanent setting. Maybe add a switch that we can control with software, although I’d hate to have to add this extra “hardware” to get a basic function to work. I guess it is just “the wrong display” (https://github.com/notro/fbtft/wiki/LCD-Modules#sainsmart-18). It seems that the sainsmart version doesn’t allow to control the backlight. Since I use this display in a remote sleep phase scanner that I am programming, it drained the LiPo battery (1000mAh) during the night. My circuit draws up to 90 mA only due to the backlight. So, this is not the display that I need. I have already ordered the adafruit version where backlight can be controlled. That’s good to know … well, not really good, but at least something to take into account when choosing this display. To wake the display up, I assume you’d use a button of some sorts. Maybe with small effort, the +5V (Vcc) can be “switched”, my initial thought was a small relay, but I’m sure there is a good way to do this in solid state. I’d have to toy around with that to find the proper way to do this. Thanks Günther for the great info! Exactly, the display should be in sleep mode mostly all the time. Only when user input is made, the display shall wake up and display data. Well, if I cut VCC to the sainsmart version, the µSD slot cannot be used anymore. Since I also need the data store, this isn’t the solution for me. :(. I will give a comment about the backlight function as soon as the adafruit version is there. Doh! I should have thought about that … good catch! Happy Easter to you too! I’ll be looking forward to your findings with the AdaFruit model. Thank you for creating this website, been very helpful. I have a problem when using my Arduino UNO with a generic Ebay 128×160 TFT display & SD card. I’m using it in the high-speed configuration. Both devices work well individually, but whenever the SD card is written to, the display will glitch. The display’s data is never lost (I don’t have to re-write over glitch data). I amusing the Arduino .h files and the chip selects are separate. It appears that the display does not like to have data on the SPI buss that does not belong to the display. I have also verified with a scope that the chip select lines are not being activated simultaneously. Have you ever run into this before? Thanks! I have ran into situations before with SPI pin issues … specially when “one” device (TFT+SD) use the same pin. However, with the proper switching I did get it to work just fine on the Sainsmart. Does the seller of your display offer any libraries/code/documentation? Hi Hans, sorry for the late reply. I did figure out that the line of code which opens the SD card for writing is what has been causing the display to refresh and blink. I checked the enable lines for the display and SD card with a scope and there is never a time when they are both enabled simultaneously. So I “fixed” the problem by minimizing the number of instances where I open the SD card for writing. But I’m happy to hear that you’ve got it to work now. You obviously gave excellent examples. I’ve only just started playing with arduino and I got the ‘slow’ screen version working second time around (first time it tried to go to wrong comm port, so I unplugged arduino board and restarted the IDE and it worked just fine). OH, and I used a Nano instead of an UNO and still it worked. Thank you. Now I just have to figure out how to write text on the screen only (temp and humidity) and log the temp/humidity/date/time data to a micro sd card and I’m set. Thank you. Great to hear that you’re having fun with this little project, and all that with a Nano – very cool! To format things nice, you might have to juggle the coordinates (setCursor) and play a bit with that, but I guess that’s also part of the fun. Above you’ll find a list with Text functions as well, like setting color and such. This is a really helpful tutorial, thanks for making it! I’m having an issue with initiating the graphicstest from the Adafruit_ST7735 library using the high speed display set-up. When I use the code you provided, nothing shows up on my screen, but when I change it so that I use option 1, the graphicstest runs fine. What’s wrong with option 2? did you change the wiring? The low-speed version uses very different pins than the high-speed version. Yes, the wiring is correct. At the moment, I have the wiring set up to also connect the SD card, but I don’t think that’s where the issue is coming from. Any other ideas? As far as I recall, that should indeed work (figure 4 I assume). Are you using a SainSmart display or an AdaFruit display? I’m using the same SainSmart display you used in this tutorial. I’m not sure if this affects anything, but the Arduino board I’m using is Mega and I’m doing my wiring over a GPS shield (I’m using the GPS for another part of my project). I’m pretty new to working with Arduino, so sorry if I’m sounding really clueless. I have not tried the MEGA yet, but I do know there are some differences (like some pins) that you have to take in consideration. The GPS shield might interfere as well. I’d start with as little components as possible so you can break down where the issue occurs. So I switched my Mega board for an Uno and now everything runs perfectly! Thank you so much for your help and patience with me, I really appreciate it! I’m sure you will get it to work with the MEGA, just have to figure out which pins to use and see if the library defines those same pins as well – just in case you’d like to figure this out in the future. I have the same st7735 , and every thing is working perfect except one thing : white screen all the time. I am new in this so I have no experience. Actually I am trying to create a good interface with the spark core and the HX8357 touchscreen to control a treadmill. I want to get access to the SD card images to make them the icons of my application. The problem is that I can’t get the access to the SD card and I don’t know why this is happening. I tried several connections between the core and the touchscreen but it doesn’t work. I took care of both CS pins separately but it seams that I am blocked with this. I think I can only get access to the touchscreen and not to the SD card. I don’t know what else to do. Can somebody help me please? I have no experience with the Spark One (I’m assuming it this one), maybe one of the other readers is more familiar with it. What I do see is that it’s Arduino compatible, yet uses an ARM processor instead of a microcontroller like the Arduino does. So I’m not 100% sure if it emulates parts or not, and how compatible it really is. Maybe the CS pin implementation isn’t as compatible as they claim (I wouldn’t know to be honest). The Spark One looks like a fun thing to play with though … is there a way to contact the developers? Do you have any tutorials for this module with the shield on? Im wondering what changes in code if the tft has the shield on it? How should I access the individual SDA/SCL pins etc? I uploaded a SDcard read/write sketch and it worked fine. Considering both your questions: I’d look and see if the pins are properly defined in the sketch for controlling the display. Unfortunately I do not have a shield version available – would be easier if manufacturers started donating stuff …. If you used a shield version from AdaFruit, and you’ve actually purchased it there, then consider contacting them as well. As for finding the right pins, some shield print it on the PCB which pin is what, so you can find to what Arduino pin they are connected. Cheaper shield versions might not have this printed on the PCB which makes it a lot more difficult. See for example figure 1. If SD works fine, but display not, then I’d definitely look at the CS (Chip Select) pin. I assume that power is OK.
Definitely SCL, SDA, RS/DC and RES pins as well. Ill uncomment and try that again later. Could that have been the cause? No, define’s need to remain commented as those are not actual “code” but more so compiler directives. What it in essence does, is (TFT_CS as example) tell the compiler to replace every occurrence of “TFT_CS” with the number “10”. In the code you’ve linked to, this is represented a little confusing. You might need to update the numbers like I did in my sketch (match numbers with what your shield is doing). I’ve matched the comments of my code with the option numbers of the code you linked to. Obviously you can use only one set with defines. I know this is a little confusing, hope it helped you in the right direction – again: make sure the numbers match the pins on your Arduino. I’ve scouted the ST7735 data sheet and Adafruit_ST7735 library. It seems backlight is not ST’s business. Besides VCC has a little impact on backlight intensity (3.3v … 5v), it’s far from enough… and I didn’t even tried to PWM on Vcc / Gnd, that would probably give weird results. That is an interesting challenge for sure,… I honestly have never worked with the backlight dimming, and the “PWM” method might be the only solution to this – if it even works. I had to do some reading to catch up (haven’t worked in quite a while with this display) and this is all I could find. I did read quite a few posts on the Arduino Forum, but the PWM method I have yet to test (see this Arduino link). I suspect this would be the only method that might work. Thanks a lot for the guide – this is great! I have a slight problem with colors – White and Black show up properly, but when I try to use Red, for example, it gives me a Blue color instead. Green and Yellow are mixed up, Cyan is not Cyan, it’s strange because I’m using the standard color codes but I have to invert them somehow to make them work. It seems to me that my codes are not RGBB but BGRR or something like that. As for the colors being BGR vs RGB; I have no clue, but I have seen these kind of “jokes” with LED strips as well. You might want to check the library. I would guess the model you’re using is not the same model as the one I have used here. The function Adafruit_ST7735 might exist for your model as well – the hard part will be finding what model exactly you have. So i read through a few comments but I am wondering how can you rotate the screen. For example the Fontsize part as well as the warning sign is read going downwards long ways but I would like to have it read going downwards short ways. So I would basically like to rotate the screen 90degrees. Nevertheless this has been an extremely helpful article. Thank you! Thank you for the compliment and even more for taking the time to post the settings/connections that worked for your Arduino Mega. It’s very much appreciated! I have the 1.8″ TFT connected to an Arduino Mega 2560 and doing image loads from the microSD card, in large part because of this post, so thanks OQMty! It loads a 160×128 24-bit BMP from the SD card and draws it to the screen in around a second (mid-1,000-ms range). I have a fair bit of noise and distortion during the draw operation, which I suspect stems from the use of a rats’ nest of unshielded breadboard wires, but once the operation is finished the imagery is crisp and clear. Thanks again for posting your code and findings! Nice!!! Thank you so much for this tutorial! After some tweaking and re-reading I got my display to spring to life! When using a .bmp from the SD card, I have to use the tft.initR(INITR_REDTAB) function instead of the black or green. With the black one, it skews the colors horribly. In fact, it seems that with every test file I have to use a different tft.init. Also, the display doesn’t seem to be aligned right. There’s a border on the right side and bottom of whatever junk is left in the buffer, and text is chopped off at the top and left. Do you think I have a bad display or could this be a wiring fault? it could be that you have a slightly different (newer probably) TFT display. Does it work fine when using tft.initR(INITR_REDTAB)? I think I’ve got it sussed out. in the graphicstest example file, there are initR’s for 144GREENTAB and BLACKTAB. The 144GREENTAB is what you use if you have the 1.44″ square display. However, the BLACKTAB was leaving the strange margin. I took a peek inside the .h file and saw lots of initR lines, and there was a line for 18GREENTAB or just GREENTAB So I tried that one and it works fine. It’s also worth noting that my display is actually 128×160, NOT 120×160 as advertised. This means that any .bmp files I create have to be 128×160 to fill the screen. If your image doesn’t fill the screen the display just leaves whatever is in the frame buffer for that area, so whatever was running in the last sketch will be there. I also noticed that there’s an include line for the GFX library nested inside the 7735 library, and my test files ran fine when I commented out my own include line. I’m taking this to mean that you don’t need to include the gfx library on its own. I would definitely try that (omitting your own include). This was not the case when I wrote this article though, and I’m traveling so I do not have the chance to test this with my own gear. Oh I don’t think including the gfx library in my sketch as well as it being referenced in the 7735 library was causing my screen margin error. I’m pretty sure that was caused by a combination of the screen actually being 128×160 and using the wrong initR. For the record however, leaving the include in versus taking it out doesn’t seem to impact the compiled size of the sketch, so I wouldn’t worry too much about redundant libraries. Thanks Mike for getting back with your findings. Yes, I would assume the compiler/linker would be smart enough to not include the same library twice. Also good to know that your screen issue was related to this. After some tries and scouting for the last year or so, I eventually found a lib (compatible with Adafruit GFX) and fully optimised for ST7735. As soon as I get home, I’ll go try this – thanks for sharing, it’s much appreciated! The only thing I have to ‘add’ is to say Thanks for making such a complete, and wonderful set of instructions. I had some old Arduino equipment and this TFT display laying around and your walk-through is exactly what I needed to make it all come together in like 20 mins. Thanks! Awesome! That’s really nice to hear! Does anyone know the capability of this device? is it possible to make it display real time data? It will show data at a reasonable speed, but I wouldn’t call it super fast. Did you consider getting one of those tiny USB monitors? Not sure what space limitations you’re looking at. The size or the TFT is perfect. 2) Use and Arduino/Sainsmart and talk to the Arduino through the “serial” port (the USB connection to your Arduino). You’d need code on the Arduino as well to process the received data, and you’d need some app on your PC to send the data through the serial port. Thank you again for your reply, you seem to be a knowledgeable chap. Thank you for the extra idea, ill probably end up doing the onld android phone route, as you did meantion that the display wobt render it very fast, I read on another page, the same, more you have to display, the slower it renders, I was hoping for a rev counter, gear selected and laptime to be displayed, but now am thinking it may be too much to render. The slower render rate, is that caused by the renderer on the lcd, or on the Arduino?? I was thinking of using an uno R3. I can get hold of a custom lcd panel from a photocopier, can I get the uno to render the info for me? Off hand I cannot remember the lcd specs, im out of town, but can check when I get home tonight. I’m not sure the speed is limited by the Arduino, but rather by the interfacing with the display. But … I could be very wrong. Simple serial displays are faster and even an old Basic STAMP (microcontroller from back in the day) works great with those. I do think youvwill be correct on all of those points. What a learning curve this is. You’re most welcome and yes … somethings are very easy with Arduino, and others (like the display) can be quite the challenge. starting several month ago with this display mentioned in this blog (you have a very helpfull blog btw) and arduino I hereby just want to give a feed back for using this nice display with an ESP8266 – it works! TFT_CS -> D8 / TFT_RST -> D1 / TFT_DC -> D4 / TFT_SCLK -> D5 / TFT_MOSI -> D7. I’ve just got one issue this evening: My Arduino IDE asked me to update several libraries, also the Adafruit_ST7735 and I agreed – but that was a mistake: During Compilation I’ve got several error messages I didn’t got until yesterday. So I decided to load again an older library Adafruit_ST7735, and now it works great again. I even use this display and a 12#-Neopixel parallel on ESP8266, and it works fine. thank you for the compliment and thanks for the info! Anyhoo … thanks for posting your findings! Nice! Thanks Cam, the compliment is much appreciated! I must ask, how good are arduinos at mulit tasking? Can I run two of these screens on on arduino?? would using a mega help? I would say that multi-tasking is not one of the qualities of any of the Arduino’s. I doubt that controlling 2 of these displays would work well/smooth no matter what Arduino you use. Maybe using a Raspberry Pi might be a better option. don’t you think, it might be a chance, to connect- lets say 3 displays – parallel to the arduino? BUT of course – the CS of each display must be connected to different pins on arduino and the code also must be partially adapted (using of tft1, tft2, tft3 instead of only tft …). Nice esp8266, they still pricey in my country, so a mega is my best option for now. I did find some cheap ESP8266’s $15 for 2 of them … so $7.50 a piece. The first comment in this thread was posted May 7, 2014, today is Feb 14, 2017 !!!!!!!!!!! Just goes to show that a GREAT tutorial remains GREAT despite it’s age! Thank you very much for the compliment and for taking the time to post it! Great tutorial!!! Thanks. “grafictest” works in my case but my display : Sainsmart 1.8″ 128×160 ST7735 just reeived seams to have a problem : for x=0,1,2 pixels are not displayed. At the right side ( fornt view of display ) there is a vertilacl line some pixels width with pixels ramdomly on or off. I think my display is defective. Do you have simmilar experince with some pieces of this display? Do you recommend any kind of action, apart to contact with saintsmart support ? It sounds like the display is defective indeed – or better said: the contact membrane is not touching it’s contacts correctly. I wouldn’t try to fix this myself, but return the display and ask for a replacement. i am new to arduino and used your configuration on below display but my display shows nothing. is there something i am missing? unfortunately, displays can be quite different even though they sound and look similar. I am unfamiliar with the model you purchased – even though it has similarities. Not sure why they would link to this article, without any details on the pin-out or other info. – Make sure the right pins are being use. As you can seen in the table above, pins are not always placed and numbered equally. I’m using a unknown brand of ST7335 Ver 2 5c. It has the same pin configuration as yours. However, when I try the low speed graphicTest all I see is a white screen. When looking at the Serial Monitor, it appears the SW is functioning correctly and outputs “hello! init 760. I’m going to resolder the pins to make sure they are contacted well. I can’t understand why I’m not seeing anything yet. Have a simple test to display a black or color screen would give me confidence i have the circuit wired correctly. sorry to hear you’re running into that issue. Definitely check the pins and resolder if needed. From your description I understand that the text next to the pins is the same as the one I used (for pins 4, 5, 6, 7, 8). Definitely make sure you’re reading the text right, on mind for example the SDA pin (5) is printed a little confusing. Thanks! I believe it was my poor solder job. I’ve now used the low speed and high speed graphic tests. I appreciate the quick reply. an einem Sainsmart TFT 1,8″ Display, angeschlossen an einem ATmega328P-PU, zeige ich Bilder von der SD Card an. Auf dem AVR befindet sich das Programm von Adafruit spitftbitmap. Auf der SD Card sind ca. 30 bmp – Dateien gespeichert, alle 66k groß. Die Anzeige im Sekundentakt klappt prima, aber nur solange im Programm nicht mehr als 15 Bilder angesprochen werden. Sollen 16 Bilder angezeigt werden, tut sich auf dem Display nichts. Als Anfänger komme ich da nicht weiter. Für eine Hilfe bin ich dankbar. Im voraus vielen Dank. mein Deutsch ist nicht so gut, und die meiste Besucher hier sprechen entweder English oder Niederlandisch, ich werde versuchen auf Deutsch zu antworten aber English were da besser fur die andere besucher hier. Hab leider die hardware nicht mehr, hab aber ein vergleichbares Problem bei einer der billig Ethernet Karten gesehen. Ralf is running into this problem. He has 66 images on an SD card and is trying to display them one at a time, one per second. Unfortunately, with this many images things seem to freeze unless he uses less than 15 images. This should reset the main chip and hopefully the display and/or the SD card reading function.